BioEnzyme is a combination of biologically active, proteolytic, lipolytic and carbolytic enzymes to aid the digestion of proteins, fats and carbohydrate. It contains bromelain and papain which assist the body with protein digestion, Lipase helps with the efficient digestion of fats and oils and Amylase is required for the complete digestion of carbohydrates. Potato Maltodextrin, Bulking Agent (Cellulose), Capsule Shell (Hydroxypropyl Methylcellulose), Papain (Sulphites), Bromelain, Protease, Anti-Caking Agent (Magnesium Stearate), Lipase, Amylase. Do not exceed stated recommended daily intake. 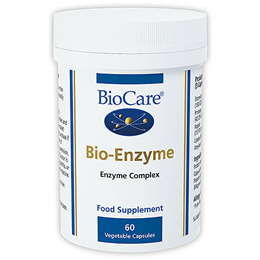 Below are reviews of BioEnzyme - Digestive Enzyme Complex - 60 Vegicaps by bodykind customers. If you have tried this product we'd love to hear what you think so please leave a review.